Kansas City rookie Brad Keller (2-3) allowed six hits in eight innings. SEATTLE — Not only was it Canada Day with “The Big Maple”, Canadian James Paxton on the mound for the Mariners’ 1-0 victory over the Royals, it also was Paxton Bobblehead Day at Safeco Field. This bobblehead included a bald eagle on his shoulder, a crazy moment that actually happened while working out in the outfield before a game this season in Minnesota. The video went viral. 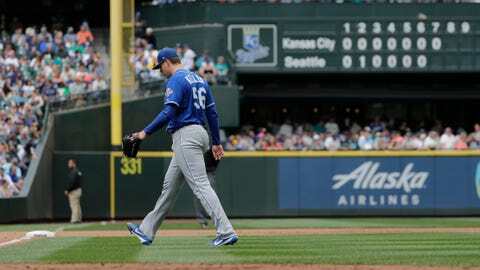 Paxton allowed only two hits and struck out 11 in eight innings to lead the Mariners to their season-best seventh consecutive victory. Paxton (8-2) had plenty of family and friends at the game from his hometown of Ladner, British Columbia. Edwin Diaz struck out the side in the ninth for his 32nd save. The Mariners are 26-11 in one-run games this season and 22-0 when Diaz enters the game with a one-run lead. Kansas City rookie Brad Keller (2-3) also was tough to hit. He allowed six hits in eight innings. The only extra-base hit he allowed was a double by Kyle Seager in the seventh inning. It was the first complete game of Keller’s career. The only run came in the second inning. Ben Gamel dropped a broken-bat single into shallow center to score Seager from second base. Seager singled to right before Ryon Healy singled to center. That’s all Paxton needed, recording double-figure strikeouts for the seventh time this season. On his 110th pitch, his last of the game to close out the top of the eighth, his fastball was clocked at 99 mph. Royals: RHP Ian Kennedy, who experienced tightness on his left side during his start Friday, had his normal throwing day in the bullpen Sunday, but Kansas City manager Ned Yost did not say whether Kennedy would make his next scheduled start. Yost said RF Jorge Soler (fractured toe and placed in the 10-day DL June 17) is still on a six-weeks-or-so recovery, so it’s likely another four weeks before he would return. Royals: RHP Jakob Junis (5-9, 4.67) will make his 17th starts of the season Monday when the Royals return home to start a three-game series with Cleveland. Junis has allowed a major league-high 22 home runs over 96.1 innings.